This is a special recipe for me, because it’s from the first cookbook I ever bought here in the US, back in 1986, when my English was poor and my cooking not much better. Since then, I moved between different countries a few times, but always managed to take this cookbook with me. Ironically enough, it is not one of those “classic” cookbooks, but a simple, down to earth publication from Sunset called “Easy Basics for Good Cooking” (first published in 1982). My copy shows the passing of the years, with stains marking many of the recipes that I cooked again and again ;-). Maybe it’s not the fanciest cookbook in the world, but whenever I pick it up I cherish the memories, remembering how I was nervous trying to translate everything correctly, to find the right ingredients, and to cook a nice meal. Allow me to share with you a recipe that I’ve made so many times, in so many different settings, that I could probably make it with my eyes closed. 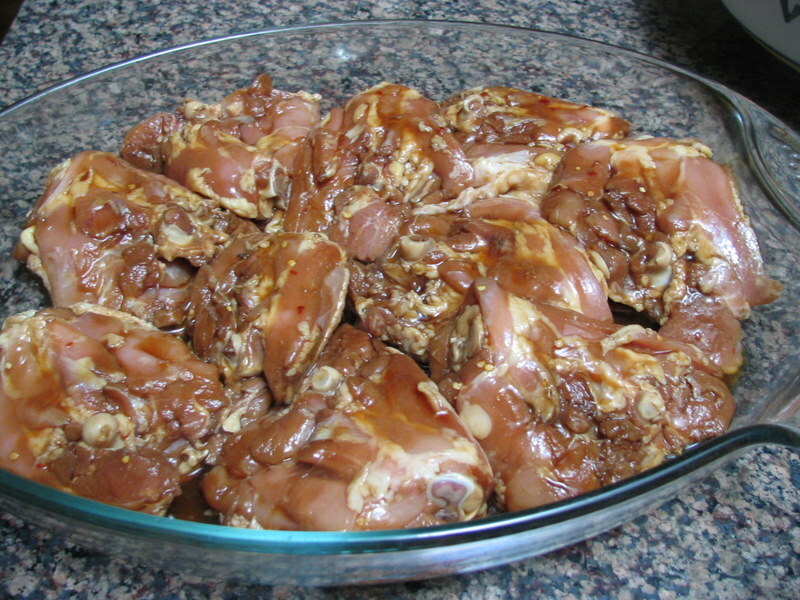 Place the chicken in a plastic bag or bowl. Combine all the other ingredients to form a marinade, mixing them well to fully dissolve the honey. Seal the bag or cover the bowl, and refrigerate from 4 to 24 hours. 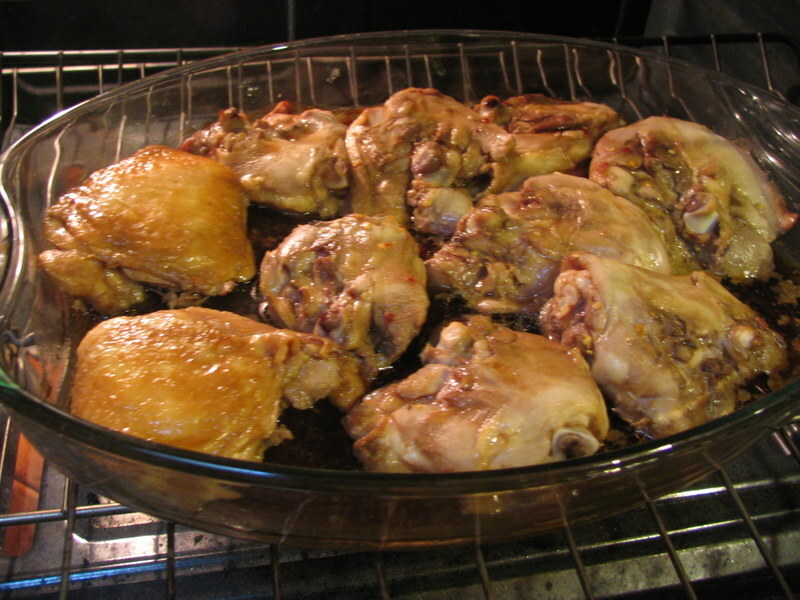 Remove chicken from marinade and place all pieces skin side down in a single layer. Pour some of the marinade over them, to reach the level of the bottom fourth of the layer (see photo after the jump). Bake, covered with aluminum foil in a 325F oven for 1.5 hours. Remove the foil, turn the chicken pieces skin side up, and bake at 425F for 20 minutes more. 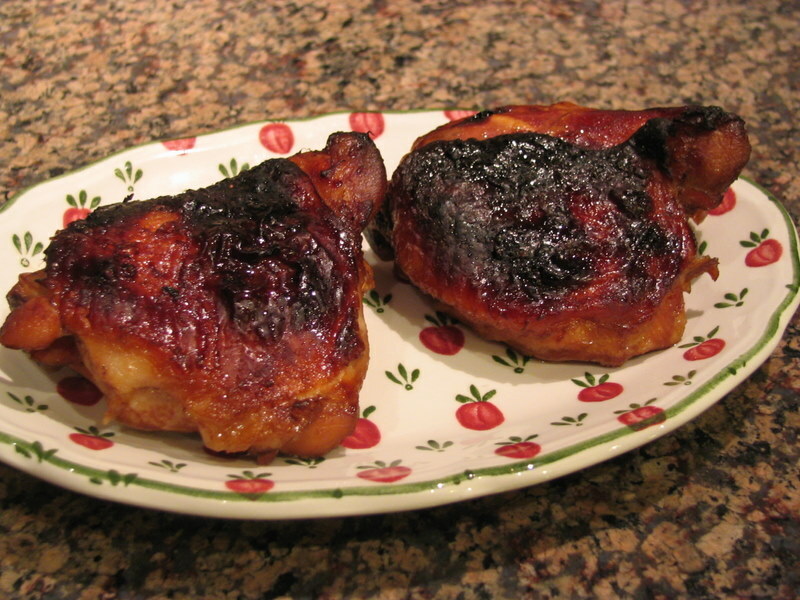 If you like a particularly crispy skin (we do!) turn the broiler on and watch carefully, as the honey from the marinade might burn. Serve it with white rice and some sauteed vegetable (baby bok choy is also perfect!). jump for additional comments and photos…. You can substitute rice wine (Shaohsing) for the dry sherry. 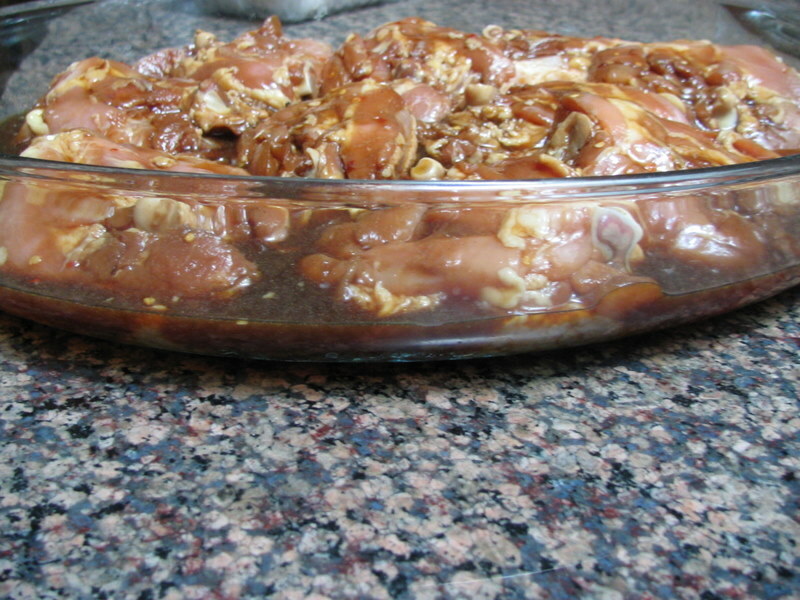 The marinade is added to about 1/4 of the height of the chicken pieces…. After 1.5 hours, turn the pieces over (two of the pieces on the left have been turned over, the skin will be soft and pale at this point). If you want to make it “weeknight-friendly”, stop at this point, return to the fridge and finish the roasting at high temperature next day. The marinade can be used as the base for a sauce, thickened with cornstarch or just slightly reduced by boiling (keep in mind that soy sauce is salty). Leftovers are still awesome next day! I love teriyaki chicken. I usually grill them by putting them on a skewer first. It’s as delicious with a smoky flavor. Mmm the remaining sauce is to die for too! Yes, perfect on the grill, although I usually go for chicken breasts when I do that. 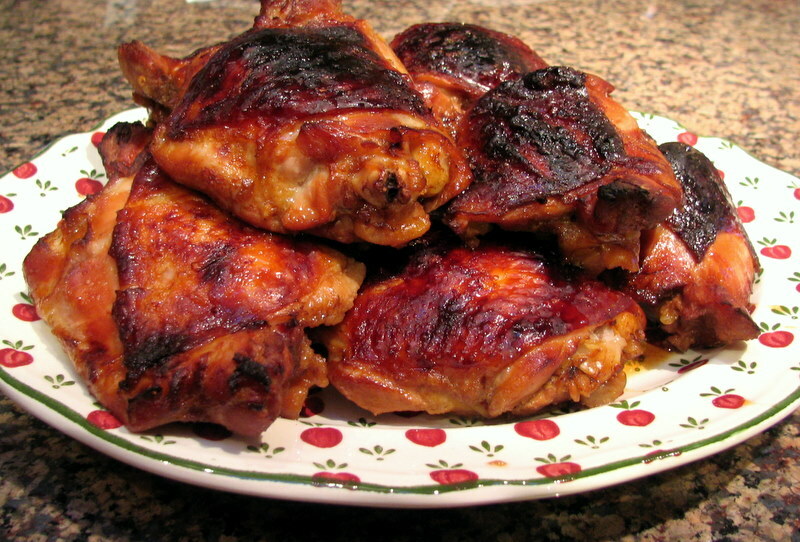 I should try this with boneless, skinless chicken thighs. Looks delish, Sally. Gotta try this one, I love chicken. I love many of my old cookbooks from long ago with their stains and memories and odd things tucked between the pages. Those Sunset books were in fact quite nice! I remember sometimes borrowing one or another from my mother-in-law. But I always returned them eventually. One magazine, though, I never did return. I felt guilty, but it was just too good. You’ll laugh: it was “Family Circle: Great Ideas—Best Ever Chicken Recipes” circa 1976. I stole it before we were married; what chutzpah I had to take it! There is a recipe called “Dindonneau au Vin” for turkey cooked in red wine that I use to this day. I was making that at mil’s house when my daughter broke her leg at age 2. Mil had to finish cooking it; luckily I’d written out the recipe and she didn’t suspect it was from her stolen magazine. I’ve served that meal at many celebrations and up North at the cottage on family vacations. It’s surprisingly contemporary with lots of recipes from around the world and very minimal compromises of ingredients: margarine or butter is often an option, canned olives are de rigor, and there is the occasional can of gravy. I don’t remember if supermarket magazines of that time were like that, but these days the recipes in them start with “cream of crap” soup and go down from there. I think it might be interesting to have people post about cookbook memories, and memorable recipes from cook-books past. What do you think? Great story, Tess! It would be very interesting indeed to get people to talk about their favorite old cookbooks, I bet there would be some surprising choices… Some of the fanciest cookbooks I have, end up being used very little, whereas “Sunset”… well…. gets intense workout!